Working Dog / Ten Network. x 30mins. 1998. Executive Producers: Santo Cilauro, Tom Gleisner, Jane Kennedy, Michael Hirsh & Rob Sitch. CD (OP) Liberation / Working Dog. LIBCD1001.2. 1999. 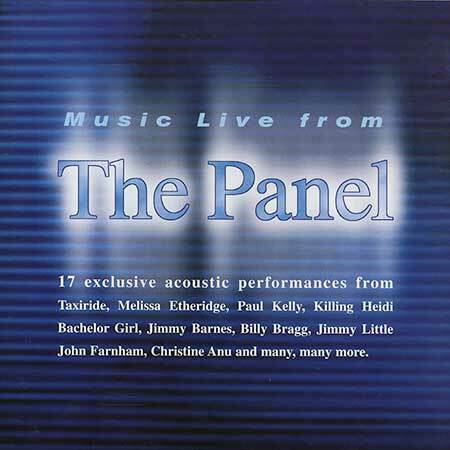 "MUSIC LIVE FROM THE PANEL". Studio Audio for Network TEN Music mixed by Russell Clyde - Network TEN Audio Dept., Tony Walker, Rick Evans, Matt Eldridge, David Hannan, Andrew Gersh Executive Producers for Working Dog Santo Cilauro, Tom Gleisner, Jane Kennedy, Michael Hirsh, Rob Sitch. Production Steven Clode - Producer, Glenn Robbins - Co-Producer, Ray Punjer - Director, Sancia Robinson - Talent Coordinator, Nikki Hamilton - Researcher, Samantha Stayner - Production Assistant, Polly Watkins - Producers Assistant, Vanitha Naidu - Production Accountant, Antonetta Russo - Accounts Assistant. Title Music Craig Harnath - Hothouse Audio. Executive Producers Warren Costello and Michael Gudinski (Liberation Music) Mastered at Studios 301 by Don Bartley / consultant Mark Opitz. 01: OPENING THEME THE PANEL. (C Harnath-Control). 02: GET SET. v: Taxiride. (TWild / Taxiride -Mushroom Music). 03: LITTLE KINGS. v: Paul Kelly. (P.Kelly-Mushroom Music). 04: BUSES AND TRAINS. v: Bachelor Girl. (J. Roche-Sony Music). 05. BY THE GRACE OF GOD. v: Jimmy Barnes. (J. Barnes / J. Barnes-EMI Music Publishing / Mushroom Music). 06: ISLAND HOME. v: Christine Anu. (N. Murray-Rondor Music). 07: BETTER MAN. v: The Warren Brothers. (Brad Warren / Brett Warren / Gary Nicholson-Control). 08: OVER IN THE WEST. v: Michael Thomas. ( M. Thomas-Mushroom Music). 09: SHE CAME ALONG TO ME. v: Billy Bragg. (W.Guthrie / B.Bragg / Wilco / Harris-Control / Mushroom Music / Festival Music / Warner Chappell Music). 10: ANGELS WOULD FALL. v: Melissa Etheridge. (M.Etheridge/J.Shanks-Rondor Music / EMI Music Publishing). 11: CAN'T TAKE THIS TOWN. v: Colin Hay. (C.Hay/J.Serua-Trafaigar Music / Control). 12: THE SOUNDS OF RAIN (PART 3). Slava Grigoryan. (W.Lovelady- Control). 13: HOME AGAIN. v: Mark Seymour. (M.Seymour / B.Paimer-Mushroom Music). 14: WEIR. v: Killing Heidi. (J.Hooper/E.Hooper-Wah Wah Music). 15: DOWN BELOW. v: Jimmy Little. (Rumour / Perkins Elliott-Universal Music). 16: I CRIED. v: Joey McIntyre. (J.Mclntyre-Warner Chappell Music). 17: SATELLITE. v: Suze DeMarchi - Satellite (S.DeMarchi / D.Leslie-Mushroom Music). 18: EVERYTIME YOU CRY. v: John Farnham. (S. Peiken/G. Sutton Rondor Music). 19: CLOSING THEME THE PANEL. (C Harnath-Control). CD (OP) Liberation / Working Dog. LIBCD2009.2. 2000. 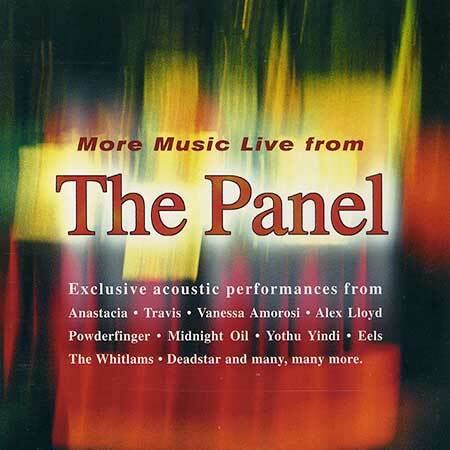 "MORE MUSIC LIVE FROM THE PANEL". 01: The Panel Opening Theme. 02: I'm Outta Love – Anastacia. 03: Blow Up The Pokies – The Whitlams. 04: Mr E's Beautiful Blues – Eels. 06: Shine – Vanessa Amorosi. 07: Why Does It Always Rain On Me – Travis. 08: Teenager Of The Year – Lo-tel. 09: Short Memory – Midnight Oil. 10: If Only – Hanson. 11: What's A Girl To Do – sister2sister. 12: Michelle Post – Hootie & The Blowfish. 13: Don't Say You Love Me – M2M. 14: Are You Still Having Fun – Eagle-Eye Cherry. 15: Deeper Water – Deadstar. 16: My Way Home – Alex Lloyd. 17: Romance At Garma – Yothu Yindi. 18: The Habenara (from Carmen) – Joslyn Rechter. 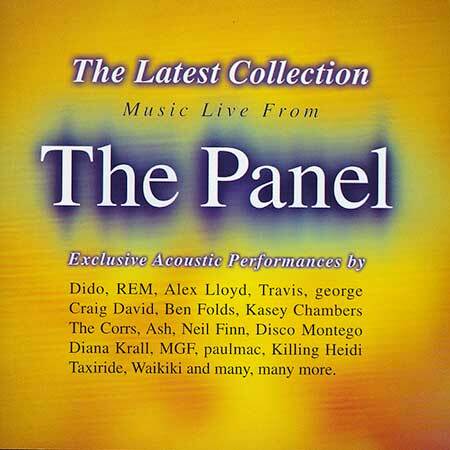 19: The Panel Closing Theme). CD (OP) Liberation / Working Dog. LIBCD4053.2. 2002. "THE LATEST COLLECTION THE PANEL". 01: Amazing – Alex Lloyd. 02: Thank You – Dido. 04: Gonna Miss You – paulmac featuring Abby Dobson. 05: Walking Away – Craig David. 06: I’ve Been High – REM. 07: Creepin’ Up Slowly – Taxiride. 08: Special Ones – George. 09: Everywhere – Michelle Branch. 10: I’m Just a Girl – Bachelor Girl. 11: Burn Baby Burn – Ash. 12: Last to Know – Neil Finn. 13: I Don’t Know Enough About You – Diana Krall. 14: Beautiful – Disco Montego featuring Katie Underwood. 15: Unsent Letter – MGF. 16: Ignorance – Kasey Chambers. 17: New Technology – Waikiki. 18: Wherever You Will Go – The Calling. 19: At Your Side – The Corrs. 20: Pleased To Meet You – Aneiki. 21: Love Without It – Killing Heidi. 22: Rockin’ the Suburbs – Ben Folds. 23: A Little Ray of Sunshine – Brian Cadd and Glenn Shorrock. 24: The Panel Closing Theme. CD (OP) Liberation / Working Dog. LIBCD6145.2. 2004. "NEW MUSIC LIVE FROM THE PANEL". 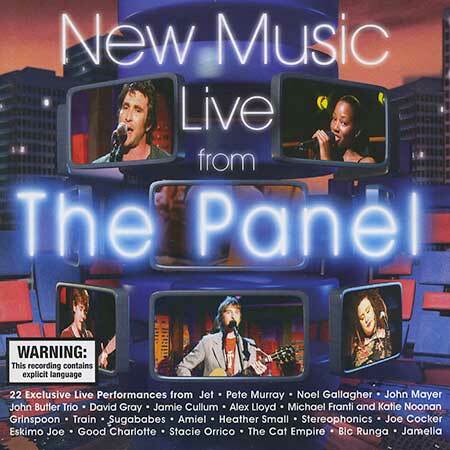 02: The John Butler Trio – Something’s Gotta Give. 04: Good Charlotte – Lifestyles of the Rich and Famous. 05: John Mayer – Bigger Than My Body. 06: Stacie Orrico – Stuck. 07: Jet – Look what You’ve Done. 08: Michael Franti and Katie Noonan – What’s Goin; On? 09: Alex Lloyd – Coming Home. 10: Jamie Cullum – These are the Days / I Get a Kick Out of You. 11: Noel Gallagher – Stop Crying Your Heart Out. 12: Train – Drops of Jupiter. 13: Heather Small – Proud. 14: Eskimo Joe – Older Than You. 15: The Cat Empire – Hello. 16: Amiel – Love Song. 17: Stereophonics – Maybe Tomorrow. 18: Joe Cocker – Never Tear Us Apart. 19: Grinspoon – Chemical Heart. 20: Bic Runga – Get Some Sleep. 21: Pete Murray – So Beautiful. 22: David Gray – The Other Side. 23: Closing Theme.